I was doing a project and it involved ASP connecting to SQL Server. Now this was a script that was being snipped, so there was a potential of having script errors. So I went through the following ordeal and found that there was a configuration that would help me to be effective in troubleshooting my errors. Here’s the scenario. This ASP page was created and I made sure that I enabled ASP in the IIS 7 configuration (Turn Windows Features On or Off in Control Panel, and IIS, and ASP). Then I saved the ASP page to inetpubwwwroot since I did not change the default directory. I then ran the page, and in IE7 it gives me this “Page Cannot be Displayed” error or something like that, and so I then went into the Tools | Options and Advanced tab, and turned off “Show Friendly Http Error messages”. Now I see “An error occurred on the server when processing the URL. Please contact the system administrator”. I could not tell where this was coming from because I did not have that sentence in my code. So I went hunting. I came across someone who went into the IIS Manager and you see in the Group By Area group in the bottom of the manager, “ASP”. If you double click on that icon, you get the following window (now notice I circled the options, the Debugging Options), and that phrase is in the line “Script Error Message”. So no matter what the message as long as the option “Send Errors to Browser” as false, you always get the above message. So when you set that option to “True”, then you will get the original messages to show up in your browser. 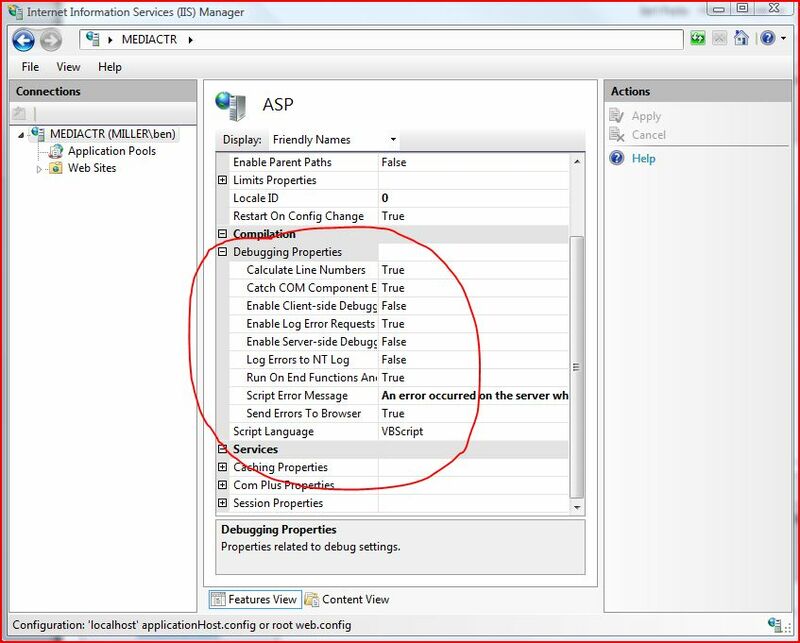 2) Open IIS 7 Manager and go to the ASP icon and double-click it. 4) Make the “Send Errors to Browser” = True so that error messages come to the browser. Hope that helps anyone running into this problem.